Found this photograph from seven years ago. 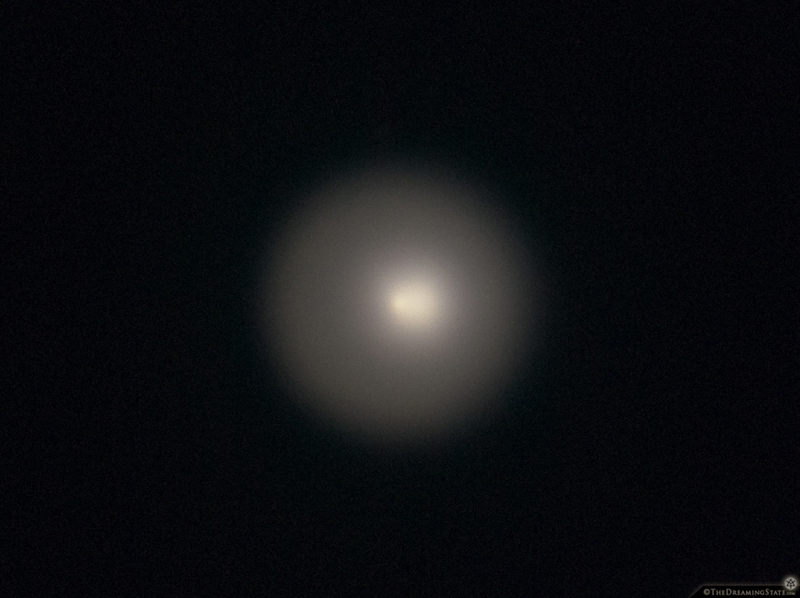 It may not look like much, but it is… I was at a local observatory photographing the moon through a telescope when I noticed something bright in the sky. As it turns out, comet Holmes had suddenly outburst becoming much brighter than usual. This was the largest known outburst by a comet. I bought a fog machine at a local Halloween store thinking it had potential to be art. That night I filled my bedroom with fog and made a digital projection with a lot of movement and color. It was really soothing to lay on the ground and look up at this. Some kind of memorizing or hypnotic effect to it… Might be hard to get this kind of work accepted in a lot of galleries. When you attach bellows and a backwards 50mm lens to your camera you can get really, really close! Here are two experimental macro shots of crystal formations of the soft heavy metal Bismuth, a chemical element with symbol Bi and atomic number 83.